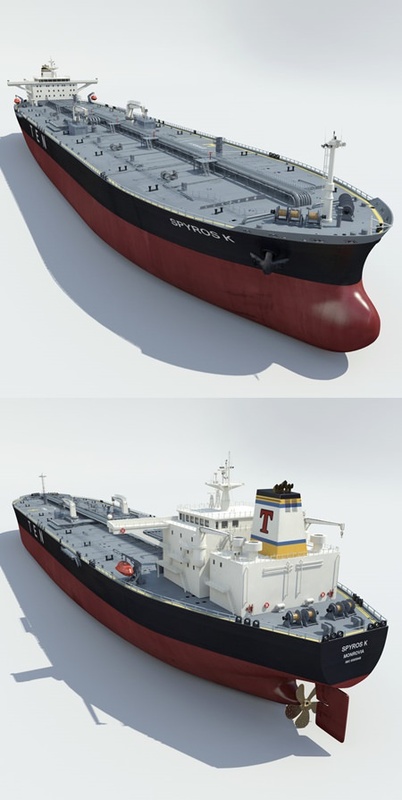 Great looking large crude oil carrier ship based on the existing Spyros K.
The hull sides and back as well as large faces of the superstructure are non-overlapping. Most of the rest of the ship is overlapping. Hull, deck surface, pipes, pipe joints, pipe brackets, winches and propeller can be smoothed. Preview images use smoothing level 2. Preview images rendered in Max 2012 w/ V-Ray. Max 2010 file with standard materials also included. Ship consists of 16 objects separated by functionality. – Clean scene without any lights, cameras or other objects.